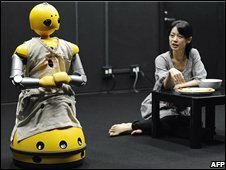 First there were dancing robots, then house-sitting robots and now a new breed of acting robots is making its big debut on the Japanese stage. The play, which had its premiere at Osaka University, is one of Japan's first robot-human theatre productions. The machines were specially programmed to speak lines with human actors and move around the stage with them. Playwright Oriza Hirata says the work raises questions about the relationship between humanity and technology. The play, called Hataraku Watashi (I, Worker), is set in the near future. It focuses on a young couple who own two housekeeping robots, one of which loses its motivation to work. In the play, the robot complains that it has been forced into boring and demeaning jobs and enters into a discussion with the humans about its role in their lives. So far, the play is only 20 minutes long but it is hoped to become a full-length production by 2010. The Wakamaru robot is manufactured by Mitsubushi but the software to train it for the stage was developed over two months at the university. The 1-m (3-ft) tall humanoid robot is best known as a mechanical house-sitter and secretary. But soon they may be signing autographs or trying to roll away from paparazzi. No word yet on whether they are pleased with the apparent job promotion.